If you are new to growing plants indoors, you have probably already figured out that you are going to need some good grow lights. Being a new indoor gardener the real challenge is what lights are the best based on ease of use, cost, and other gardening factors? We wanted to do a review based on the best grow lights for amateur indoor growers. Many brands of grow lights were thrown in the pot to be reviewed and as we shuffled through the different possibilities we finally landed on the Mars Hydro 300w LED grow light for many reasons. Let’s get into the Mars Hydro 300w review here in a second. We chose the Mars Hydro 300W for a few good reasons that are geared to a new indoor grower. An LED grow light for one costs less to run and operate than older bulbs that glow hot and have less spectrum than that of their Light Emoting Diode counterparts. A bonus for beginning gardeners. For one, LED offers a full spectrum of lighting, rather than swapping out different bulbs during different plant phases you only need one good LED grow light. Second, the cost of purchasing extra fans is reduced becuase LED’s give off far less heat than say an HPS bulb. And third, they last a long time. The typical LED lasts around 50,0000 hours. That is a ton of plant you can grow in that time frame. The LED by Mars Hydro is one of those models that is cheap in price but powerful in quality. A great combo to have. We used a couple of different seedlings for our test review grow in order to give feedback, not only on the lights functionality but also the final product and its yield. The strain of plants we used to grow was our indica hybrid bud, White Walker and a classic Maui Wowie. Ordering 2 lights from Amazon the packages came and was discrete in the standard packaging, but there is an option on top of this to request discrete packaging should you live in a place that indoor growing is frowned upon. We started with our seedlings sitting beneath our easily hung Mars 300w LED. The Mars was easy to install, hang and power up. The packaging included a pair of steel hanging kits a power cord and of course the Mars Hydro LED grow light for our reviewing pleasure. There is no need for a fancy ballast as the hanging kit did the job and was easy to adjust as our plant canopies began to grow. The 2 by 2 foot growing area was perfect for 1 plant at its recommended hanging height of 12″ to 30″ above the plant tops depending on the plant phase. The full spectrum light produced from the LED is not bright to the naked eye but I always reccomend using protective UV glasses when dealing with any LED as to not damage your eyes. A good choice (I own several pairs) are the Apollo Horticulture UV400’s. Affordable and provide decent protection. 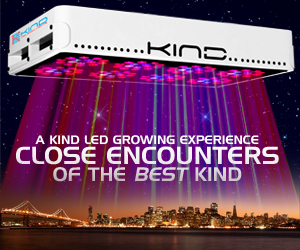 Single plant flowering is easy with this LED grow light. However, the strength of the light, being smaller seemed to lack the power it needs during the bloom cycle which gave us slightly lower yields. Not a terrible yield by any means but if you intend to grow more plants a larger wattage might be required. Having no on off switch is also a bit of an annoyance with this light. This means that when you want to turn the light off you must unplug it from the wall socket. Again , not a huge disadvantage and I am guessing this is one reason the light is less expensive than its counterparts. From the affordable price to the ability to grow in tight places like a small closet or tent the Mars Hydro Mars 300 watt LED grow light is the perfect choice for those just starting out as new growers. With not many over the top features it keeps things simple and the price low. It is a great light that can teach you the fundamentals of growing and light supplementation. What was the yields of the plants?